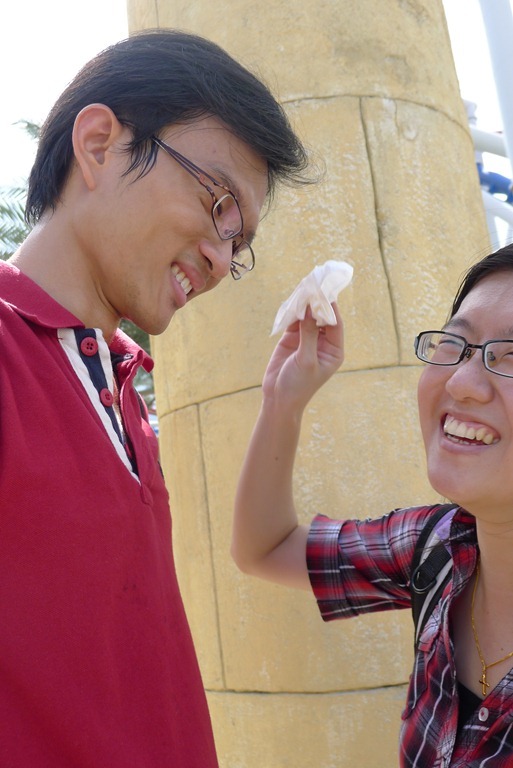 Last weekend, two of my hometown friends (Yong Shen and Leslie) came to visit. 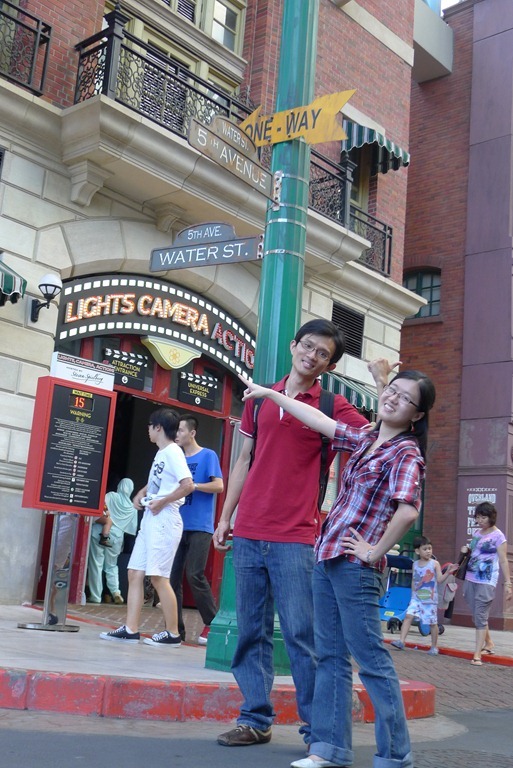 As planned, we went to Universal Studio on Sunday, 12th Feb. The tickets were bought online two weeks earlier. After a 15% discount, we paid roughly RM150 each. 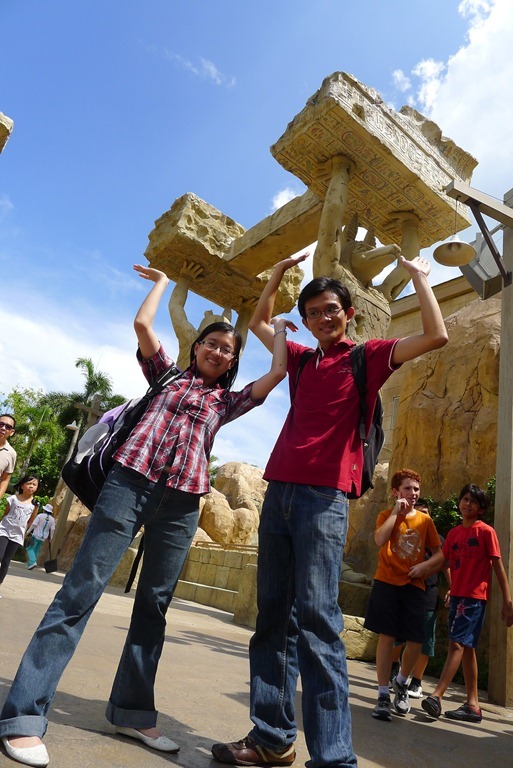 We went there by bus and it only cost us RM10 per person (from Sri Puteri bus station straight to Resort World Sentosa). 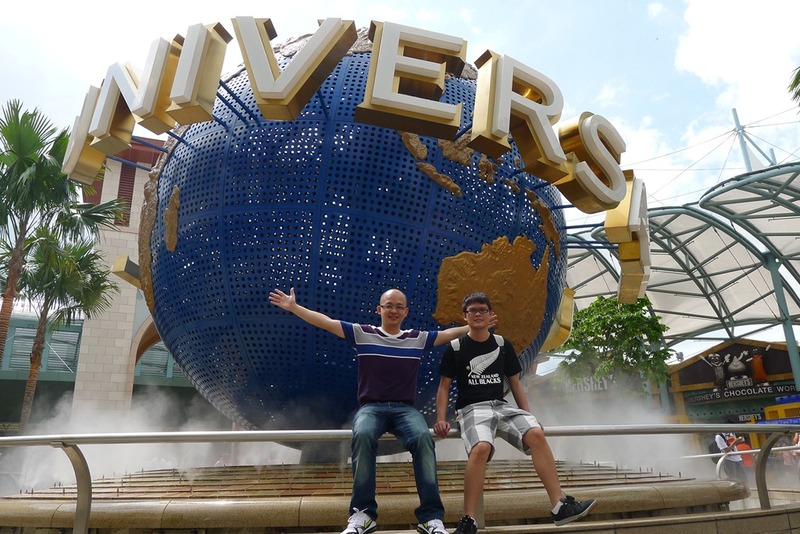 After a two-hour journey, we finally arrived at Universal Studio at around 11.30am. 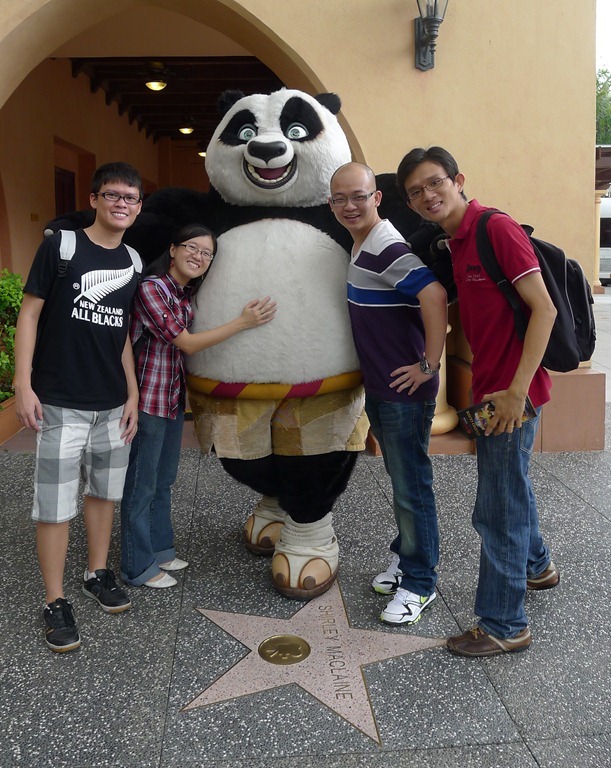 As we walked down the street of Hollywood, we were welcomed by Po the Panda. 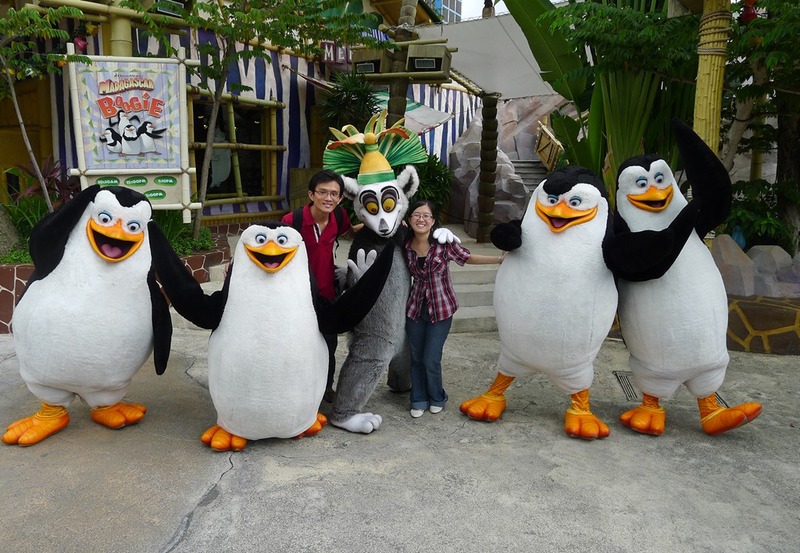 There wasn’t much to see at the Hollywood zone, so we moved on to Madagascar zone after snapping a few photos. 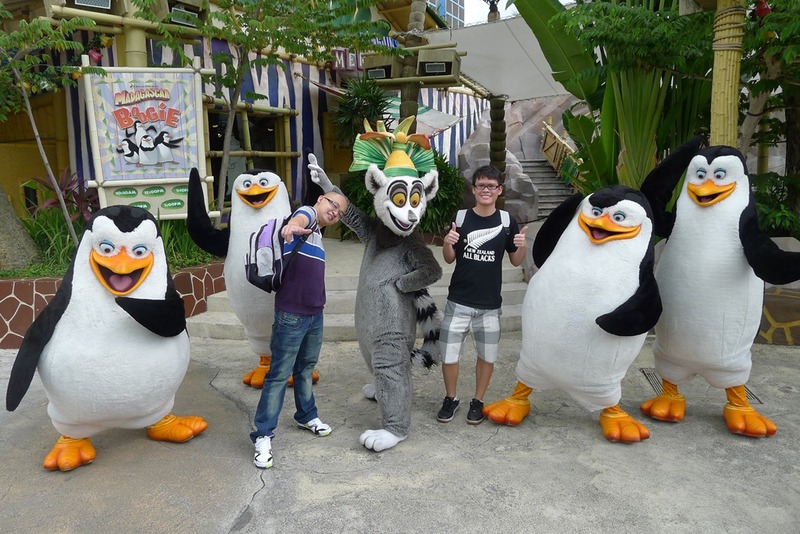 Our first ride for the day was “Madagascar: A Crate Adventure”. It wasn’t too bad, but it didn’t impress us either. 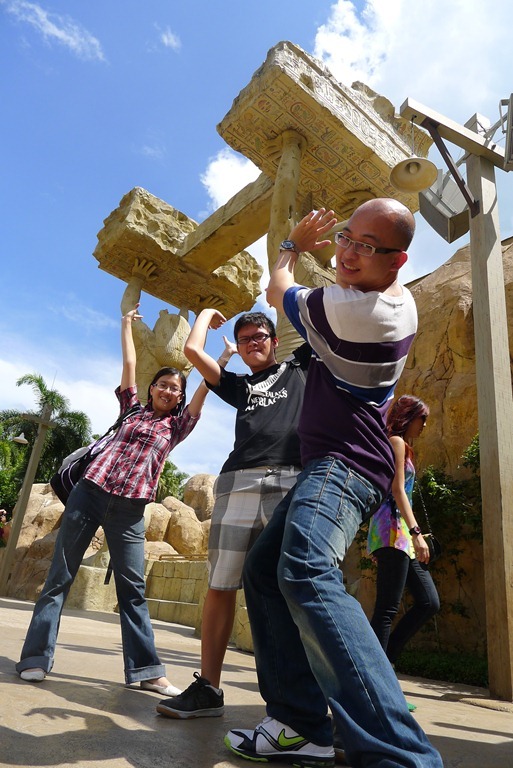 After the ride, we ventured into the land Far Far Away where we joined Shrek and Princess Fiona in a 4-D adventure. 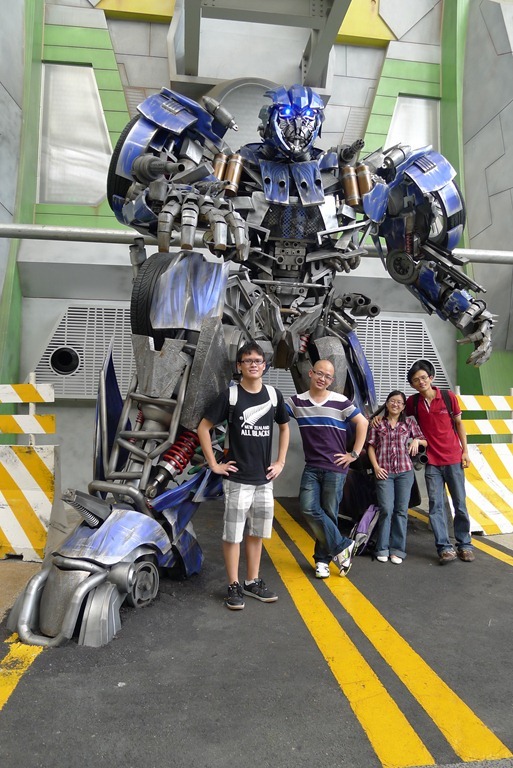 We were truly impressed by the special effects. We also went on “Enchanted Airways”, a junior roller coaster, while we were at Far Far Away. It was pretty thrilling albeit short. After refueling our tummies (we brought a loaf of bread and chocolate bars), we attended Donkey’s LIVE show at Hook’s Knight Club. The interactive ‘live’ show turned out to be rather entertaining. The next stop was the Lost World (Jurassic Park). We skipped some of the attractions there (too many people waiting in the queue for Canopy Flyer; and we’re too “old” to go for Dino-Soaring which would suit little children more). 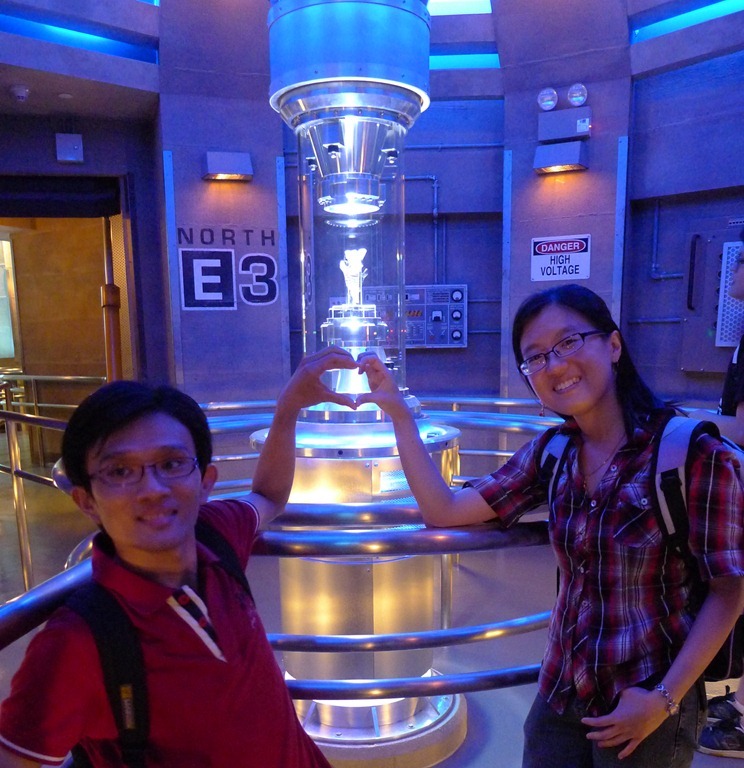 In the end, we only went for the Jurassic Park Rapids Adventure. We had to wait for more than half an hour to go on this ride. 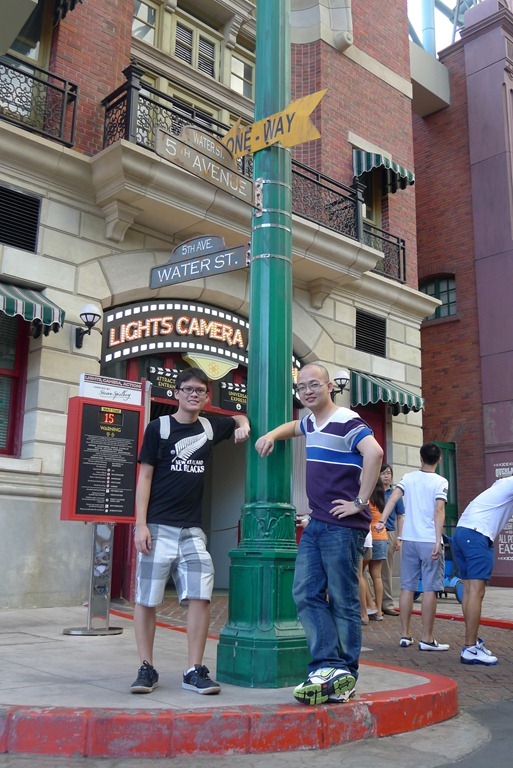 It was a let down though as it failed to meet our expectations (long queue => high expectation). 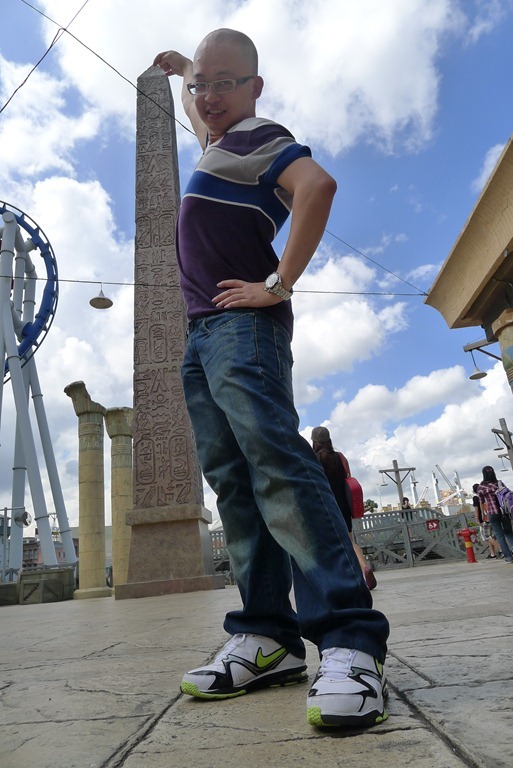 We enjoyed ourselves posing and taking photos in Ancient Egypt(as evident in the pictures above). 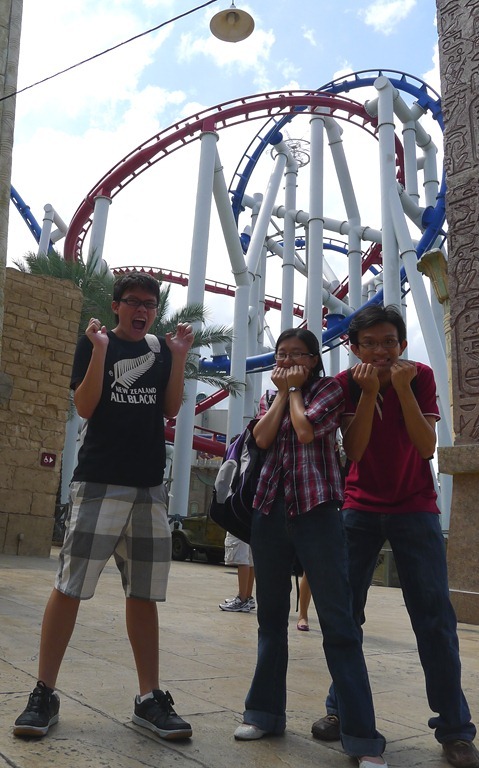 All four of us went on the Revenge of the Mummy indoor roller coaster ride. The fact that we were moving at high speed in total darkness, combined with sharp turns, fast reverse and sudden plunges gave us a shot of adrenaline. 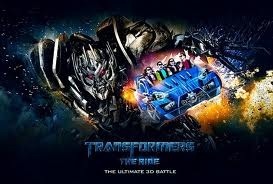 It was thrilling but I didn’t really enjoy the experience. The darkness, fire and evil voice made me think of hell – a horrible place. 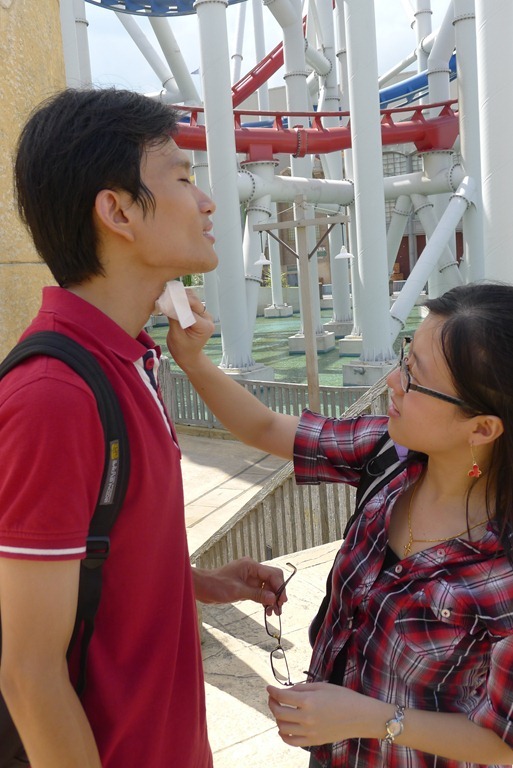 Wow, look how macho Yong Shen is! He went on the Battlestar Galastica: HUMAN roller coaster alone; the other three chickened out. Kudos to Goh the Great! While the rest of us were enjoying the ride, he was busy trying to figure out how the effects were created. He is truly an engineer at heart. From Sci-Fi City, we walked to New York Street where we sat on the curb to enjoy a street dance performance. The dancers were pretty good at it! It was around 5pm by then and our tummies were growling. We shared a delicious dish of lasagna at Loui’s NY Pizza Parlour. We initially thought of hanging around to wait for the Hollywood Dreams parade, which was scheduled for 6pm. Unfortunately, the parade was cancelled due to rain. 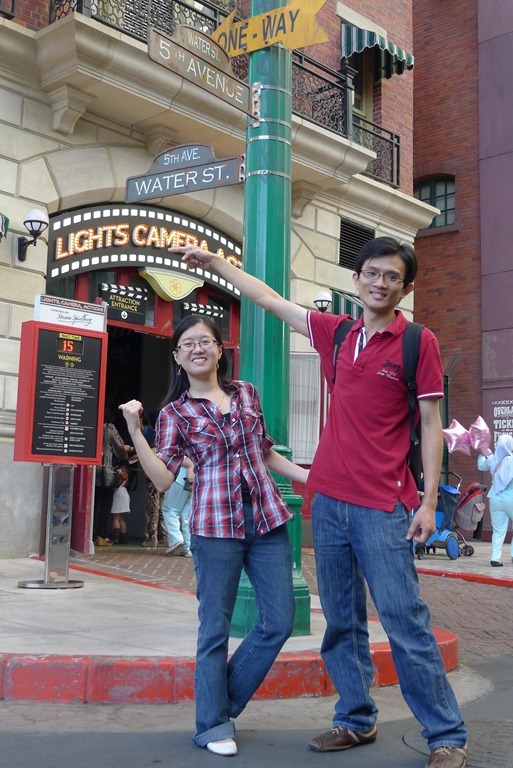 Before we bid farewell to Universal Studio, we made one last stop at Lights, Camera, Action! There, we witnessed an empty sound stage turn into the setting for a major hurricane in NY city. It was pretty impressive.